The Emerald Isle St. Patrick’s Day Festival is one of the best ways to celebrate on the Crystal Coast. A long-standing community celebration, the festival is open to everyone. It’s a great way to get the whole family outside for some holiday fun this St. Patrick’s Day! When you come to the coast for the amazing Emerald Isle St. Patrick’s Day Festival, make sure you have our complimentary Vacation Guide handy! It’s full of ideas on more things to experience while you’re here, like amazing restaurants, interesting attractions, and ways to enjoy the beauty and culture of the North Carolina coast. When the festival is over, it will be easy for you and the family to decide on another fun activity you’ll all enjoy. It’s the perfect way to ensure a great time during your next trip to the beautiful Emerald Isle! The Emerald Isle St. Patrick’s Day Festival is an outdoor fair featuring vendors, activities, food and a variety of exciting activities. Bring your family out to enjoy arts and crafts, clowns, and entertainment on the main stage. Show your shamrock pride with a fun face painting, and whirl around on the amusement rides for some adventure! The Oak Grove Stables Petting Zoo will also be at the festival, so animal lovers can make some new furry friends. Musical groups will be parading around the event throughout the day, bringing life to the festival with drums, pipes, and smiles! If your little ones love to get into the spirit of the holiday, enter them in the Little Ms. & Mr. Leprechaun contest! Boys and girls ages 2-3 and 4-5 can participate. Each participant is scored based on the creativity of their costuming, so make sure to give it your all! Participation is limited to 20 children, so make sure to sign up soon! Leaving the Kids at Home? Sham-Rock the Night Away on St. Patty’s Day! If you’ll be enjoying the Crystal Coast without any little ones the weekend of the party, not to worry! Adults can have their own fun at the Emerald Isle St. Patrick’s Day Festival, too! Check out the main tent at the event. You must be 21 or older to enter, as it’s where much of the grown-up excitement will be happening. Also, make sure you stop by the beer garden for some bubbly beverages while you’re celebrating! After a great party at the Emerald Isle St. Patrick’s Day Festival, come back to a Spinnaker’s Reach vacation home to relax for the night. Our homes are located just minutes from the festival grounds, so they are ideally located for revelers coming to town for this amazing event! The best part is that you don’t need luck to stay in one of our stunning homes! With so many beautiful rentals to choose from, you can be sure that we have one that’s perfect for you and your family. Contact us today! 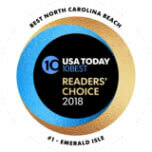 We’ll be happy to assist you in planning an amazing vacation to Emerald Isle, NC! 4 Emerald Isle Seafood Restaurants You Will Love — Have a Fantastic Day at Hammocks Beach State Park!